Searching for the faintest of signals in hopes of detecting an extraterrestrial civilization demands that we understand the local environment and potential sources of spurious signals. But we’ve also got to consider how signals might be transmitted, the burden falling on SETI researchers to make sense out of the physics (and economics) that constrain distant beacon builders. James Benford, CEO of Microwave Sciences and a frequent Centauri Dreams contributor, now looks at the problem in light of recent transients and discusses how we should move forward. The recent activity on Perytons leads us to a major lesson. We have a vast microwave network all around us that can interfere with transient radio astronomy. Our cell phones, though not powerful, influence the stronger transmitters and antennas of the cell phone towers. Add to that the many Internet hubs, microwave ovens, wireless equipment and extensive communication webs. All these may have fast transients with features that are largely unreported. Filtering out extraneous sources is very important in the broader context of radio telescope astronomy, especially for the growing field of transient radio astronomy. There are many types of possible astronomical transients: of course pulsars, but also magnetars, rotating radio transients (RRATs), gamma ray burst afterglow in radio, etc. And there may be ETI beacons, which are likely to be transient as well. This may apply especially for the beacons I, and my coauthors Gregory and Dominic Benford, have explored in earlier papers. We argued on economic grounds (both capital costs and operating costs) that they are likely to be transient. [See SETI: Figuring Out the Beacon Builders and A Beacon-Oriented Strategy for SETI, as well as the citations listed at the end of this article]. 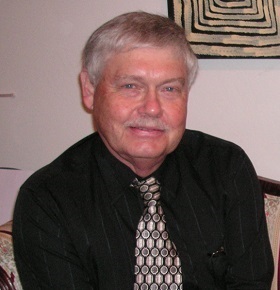 Traditional SETI research takes the point of view of receivers, not transmitters. This neglects the implications of a simple fact: a receiver does not pay for the transmitter; the sender determines what to build. But most radio astronomy observers are unfamiliar with the technologies and techniques of transmitters, whether it’s commercial electronic equipment, military equipment or SETI beacon builders. Image: Magnetar SGR 0418+5729 with a magnetic loop. 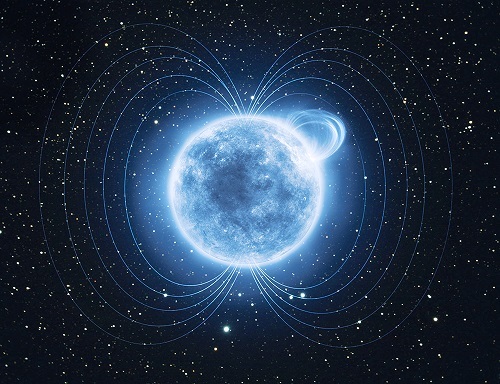 Magnetars, a potential source of transients, are peculiar pulsars – the spinning remnants of massive stars – that are characterized by unusually intense magnetic fields. Astronomers discovered them through their exceptional behavior at X-ray wavelengths, including sudden outbursts of radiation and occasional giant flares. Credit: ESA/ATG medialab. A specific example: Identifying the source of Perytons at the Parkes radio telescope – the microwave ovens – is incomplete. It misses identifying a cause for the observed frequencies received following a descending curve, flattening a little at later times. That’s approximately like the ‘dispersion measure’ (DM) due to interstellar plasma. [see Perytons: A Microwave Solution]. How can that happen in a microwave oven? A jerked-open oven door cuts off the voltage V to the magnetron. The frequency emitted from a magnetron scales as V/B, with the magnetic field B fixed by a permanent magnet. Voltage is proportional to frequency (f~V), so emitted frequency falls as the voltage declines and turns off. The magnetron passes through several lower frequency modes, which explains why the intensity of the radiation varies up and down as modes wax and wane. Because of the increasing emphasis in radio astronomy on searching for transients of many varieties, the point of view has to change. Radio astronomers had best study the transient background in detail, to eliminate false positives in their search for unusual astrophysical events. And the Peryton episode is a reminder for SETI that every possible alternative has to be explored before fingers are pointed at an extraterrestrial explanation. This could be a bit tedious, but it’s essential. And it could avoid future embarrassments. If it’s any consolation, any transmitting aliens hailing us may have considered this as well. Possible implications for our search strategies should be explored. For more on the Benfords’ papers on beacons, see James Benford, Gregory Benford and Dominic Benford, “Messaging with Cost-Optimized Interstellar Beacons,” Astrobiology Vol. 10, No. 5 (2010), pp. 475-490 (abstract / preprint), and the same authors’ “Searching for Cost-Optimized Interstellar Beacons,” Astrobiology Vol. 10, No. 5 (2010), pp. 491-498 (abstract / preprint). Another point, made by David Messerschmidt & Claudio Maccone separately, is that ETIs can minimise their transmitting power requirements in several different ways. Thus we’re unlikely to catch any interstellar messaging accidentally. We might have power-beams or radar-sweeps come our way, but anything else is likely to be meant for “us”. I sure wish we had that radio telescope complex up and running on the far side of the moon. No unshielded microwave ovens allowed, of course. Is this another selling point for Optical SETI? Yes any light or infrared beams coming from elsewhere would have to be aimed directly at Earth for us to detect it, but then again that would mean the message was almost definitely meant for humanity. Radio SETI continues to prove problematical on a world with a noisy, growing civilization. Plus advanced ETI with an interstellar wide society would probably use something far more efficient than radio to get their messages across the galaxy. FRB’s are NOT linked to perytons, according to the latest Parkes team paper, but Michael Hippke (et al) cast doubt on an extragalactic nature due to the first 11 baving dispersion measure DELAYS very close to integer multiples (one to six) of 187.5, AND a POSSIBLE CONNECTION in some way, to Co-Ordinated Universal Times. If this connection ewre VERIFIED, it would ELIMINATE et beacons from consideration, leaving a secret (military?) sattilite as the leading candidate. My question is: Having eleven co-ordinates IN HAND, do we have enough information on hand to PLOT the orbit, and try to IMAGE the sattilite using ground-based telescopes? I am curious about the presumption of any group to speak for all of the people of Earth. What permission do these groups have from established governments to actively seek out ETI by means of directed scanning, the purpose of which is to shine a ” we are here” beacon on the Earth? RF broadcast communications technology in all forms creates RF leakage that dwindles with distance and becomes mixed with background galactic RF to become useless noise by the time it reaches the edge of the magnetic influence of our sun. Considering the fact that we are seeking, by direct contact, to find a like species should give pause to those who would endanger the entire planet to welcome alien beings of unknown intent. A number of WOW-like signals have been detected by SETI…perhaps the most interesting is the one in 2010 from TYC 1220-91-1 which is a solar near-twin older than Sol about 100 LY away in Aries. It was on the PiH magic frequency of 3.14 * 1420 MHz. Yes, have there been any followups on this signal? I asked the same question elsewhere on Centauri Dreams just over a year ago. Still waiting for an answer or an update on any followup actions. In 2007, David Narkevic was using a new algorithm to chug through 480 hours of archived data collected by the Parkes radio telescope in Australia. The data was already six years old and had been thoroughly combed for the repeating drumbeat signals that come from rapidly-rotating dead stars called pulsars. But Narkevic, a West Virginia University undergrad working under the supervision of astrophysicist Duncan Lorimer, was scouring these leftovers for a different animal: single pulses of unusually bright radio waves that are known to punctuate the rhythm of the most energetic pulsars. “We couldn’t think of any radio-frequency interference that would mimic those characteristics,” says astrophysicist Maura McLaughlin, also of West Virginia University, who was part of the discovery team. The researchers also ruled out some of the usual cosmic suspects: The burst was too bright to be a spasmodic eruption from a pulsar and too high-frequency to be the radio counterpart to a gamma-ray burst. Magnetars, highly magnetized neutron stars that sizzle with X-rays and gamma-rays, remained a strong possibility. Next post: Voyager to a Star?